Edward Lear (1812–1888), Benares (1873), watercolor with pen in brown ink over graphite and gouache on moderately thick, rough, beige wove paper, 34.3 x 50.8 cm, Yale Center for British Art, New Haven, CT. Wikimedia Commons. Despite his troubled childhood, grand mal epilepsy, asthma, bronchitis, bouts of depression, failing eyesight, and lack of formal art education, Edward Lear (1812–1888) had been Britain’s finest natural history painter and illustrator, and since 1836 had switched to making outstanding paintings of his travels around the Mediterranean and beyond. Lear first visited what is now Israel when he was living in Rome, in 1858. 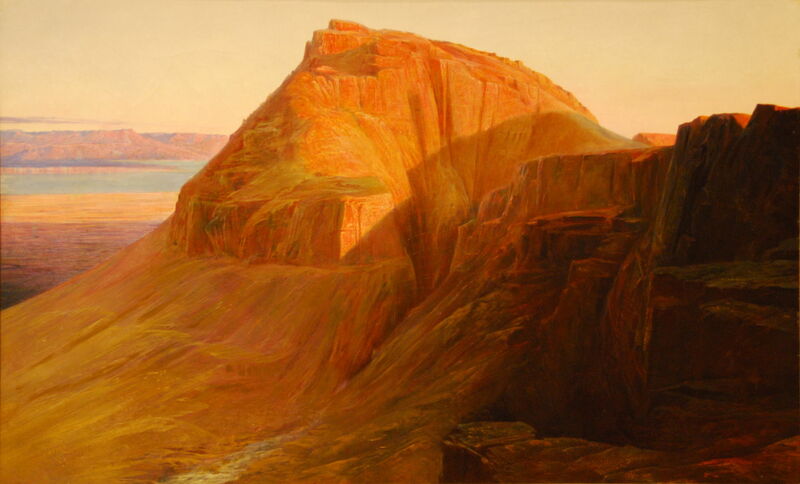 Edward Lear (1812–1888), Masada on the Dead Sea (Sebbeh on the Dead Sea) (1858), media and dimensions not known, Fine Arts Museums of San Francisco, San Francisco, CA. Wikimedia Commons. That year, he painted Masada on the Dead Sea or Sebbeh on the Dead Sea, a breathtaking view of this major historical and archaeological site at sunset. The site had only been identified twenty years earlier, and initial archaeological work didn’t start there for a century after Lear painted this. Edward Lear (1812–1888), Jerusalem from the Mount of Olives (1858-59), oil on paper mounted on canvas, 45.5 × 74.5 cm, Israel Museum מוזיאון ישראל, Jerusalem, Israel. Wikimedia Commons. 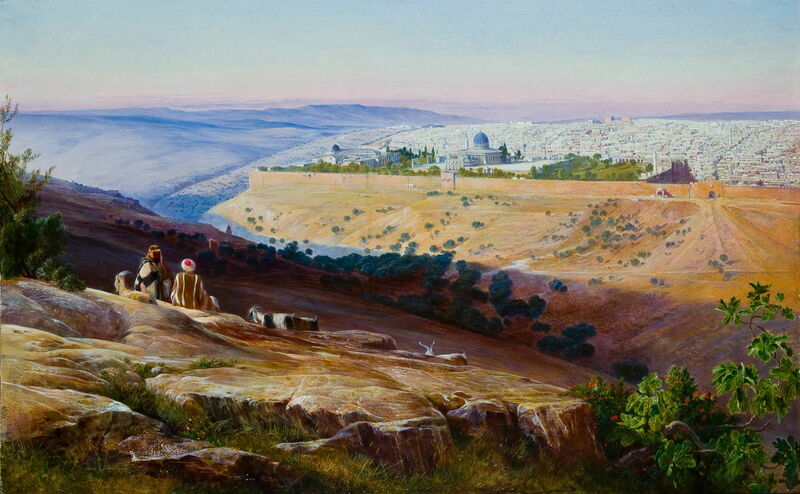 Lear’s meticulously detailed view of Jerusalem from the Mount of Olives from 1858-59 was painted in oils on paper, so may have at least been started in front of the motif. This was made several years before John Brett painted his almost hyper-real view of Florence from Bellosguardo (1863), and more than a decade before Frederic Edwin Church’s more romantic Jerusalem from the Mount of Olives (1870), but appears almost unknown by comparison. Edward Lear (1812–1888), Corfu from Ascension (c 1860), oil on canvas, 34.3 x 54.6 cm, Yale Center for British Art, New Haven, CT. Wikimedia Commons. In 1861, Lear settled in Corfu until 1864; although possibly dated slightly earlier, I suspect that this view of Corfu from Ascension (c 1860) was made during that time. It has his signature snow-capped peaks in the far distance, here of the Albanian mountains. Edward Lear (1812–1888), Zagori, Greece (1860), oil on canvas, 39.4 x 25.4 cm, Yale Center for British Art, New Haven, CT. Wikimedia Commons. 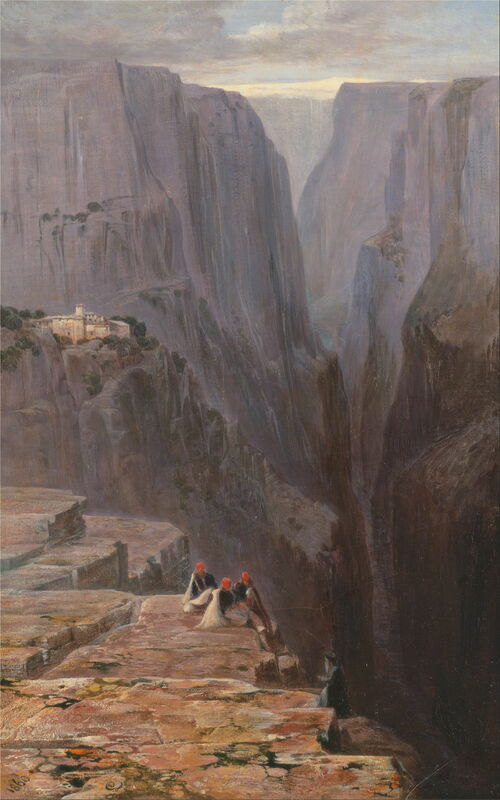 Lear developed a distinct love of dramatic scenery, as shown in this view of the Pindus Mountains in Zagori, Greece (1860). I suspect that this may be part of the spectacular Vikos Gorge, now a major tourist attraction in the area. 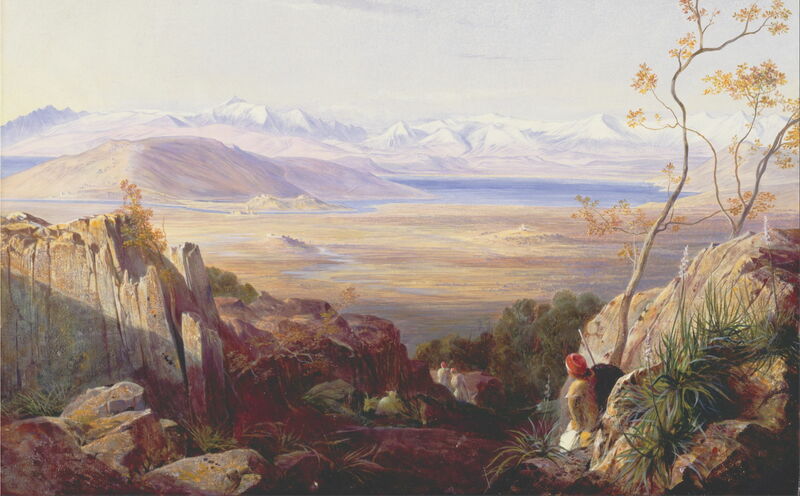 Edward Lear (1812–1888), Butrinto, Albania (1861), oil on canvas, 34.3 x 54.6 cm, Yale Center for British Art, New Haven, CT. Wikimedia Commons. 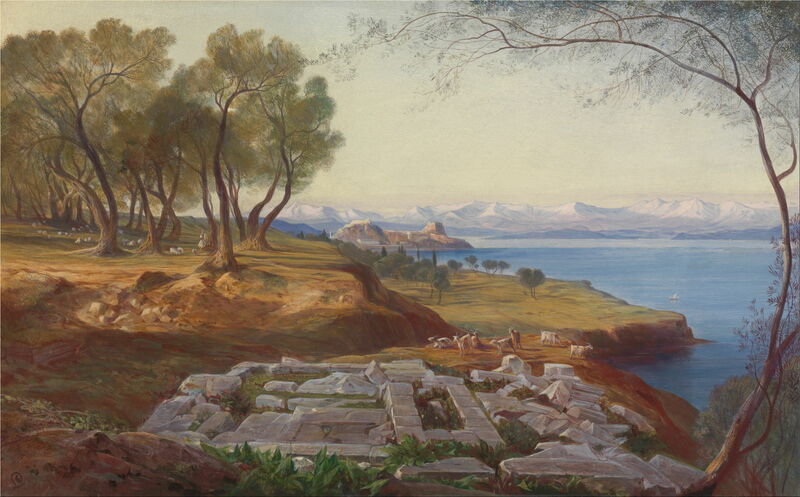 Corfu was an ideal launchpad for Lear’s further exploration of Albania, where he painted this view of Butrinto, Albania (1861). Also known by its Roman name of Buthrotum, this has remains of ancient Greek and Roman cities, and is on the coast near the border with Greece, where the island of Corfu reaches closest to the mainland. Until 1864, Corfu had been under British rule. When that ended, Lear returned to Britain briefly, then toured the Mediterranean coast of France and Italy, walking from Nice to Genoa and back – a total distance of around 240 miles. In 1867, he settled in Cannes, where he painted some of his finest watercolours and remained until 1870. He also composed The Owl and the Pussycat, for a friend who was unwell and confined to bed. Edward Lear (1812–1888), A View of the Harbour at Cannes (1869), watercolor with pen in gray ink, and gouache with scraping out over graphite on thick, rough, cream wove paper, 16.7 x 51.1 cm, Yale Center for British Art, New Haven, CT. Wikimedia Commons. At that time, what are now busy resorts along that section of coast were still quiet, and little exploited. Lear’s magnificant watercolour View of the Harbour at Cannes (1869) captures the tranquillity, although the steam ship was a sign of what was to come at the end of the century. Edward Lear (1812–1888), A View of the Pine Woods Above Cannes (1869), watercolor, 16.7 x 51.3 cm, Yale Center for British Art, New Haven, CT. Wikimedia Commons. A few small groups of people are shown in his watercolour of A View of the Pine Woods Above Cannes (1869). I suspect that these woods have long since disappeared as the area was developed. In 1870, Lear finally decided to make himself a more permanent base in San Remo, in north-western Italy, on the Mediterranean coast. He bought some land there, had a house built which he named the Villa Emily, and moved in during 1871. The following year, he set off for India, but only got as far as Suez, where the canal had only been officially opened three years previously. He eventually undertook his tour of India and Ceylon in 1873-75, after which he returned to Britain. 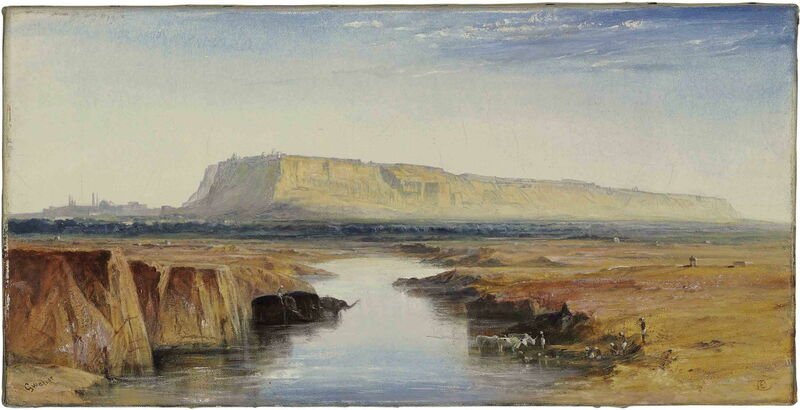 Edward Lear (1812–1888), View of Gwalior, India (1840), oil on canvas, 23.5 × 46.3 cm, location not known. Wikimedia Commons. This View of Gwalior, India is allegedly dated 1840, although Lear did not visit India until 1873. It is also painted in oils, which in any case makes it later than about 1852. Gwalior is a major city in northern central India, about 200 miles to the south of Delhi, with a particularly rich range of historic buildings, seen to the left of the large plateau. 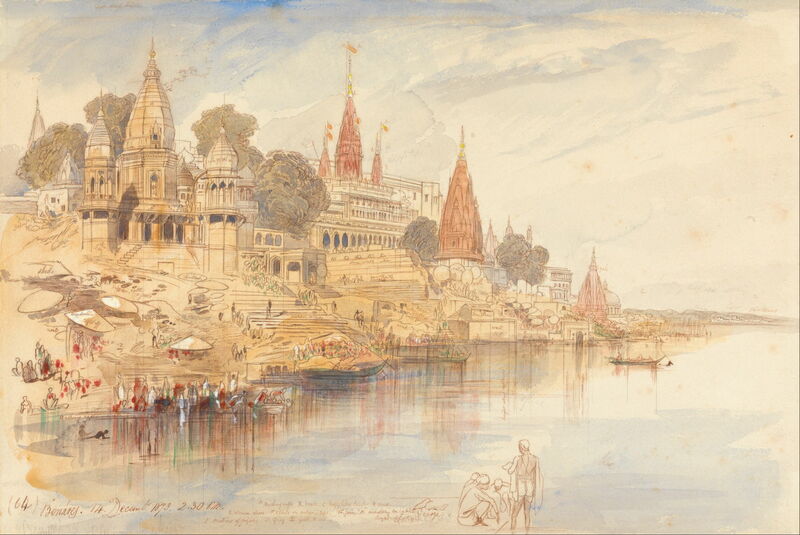 Lear’s watercolour of Benares (1873) shows another city in northern central India, here to the east of Gwalior, on the banks of the River Ganges. Now better known as Varanasi, it is a religious centre, being the holiest of seven sacred cities of the Hindu and Jain faiths, and an important location in the history of Buddhism too. Edward Lear (1812–1888), Coolies on the Road near Kalicut, Malabar (date not known), watercolor with body color and gum arabic on wove paper on medium, moderately textured, cream wove paper, 25.4 x 39.5 cm, Yale Center for British Art, New Haven, CT. Wikimedia Commons. 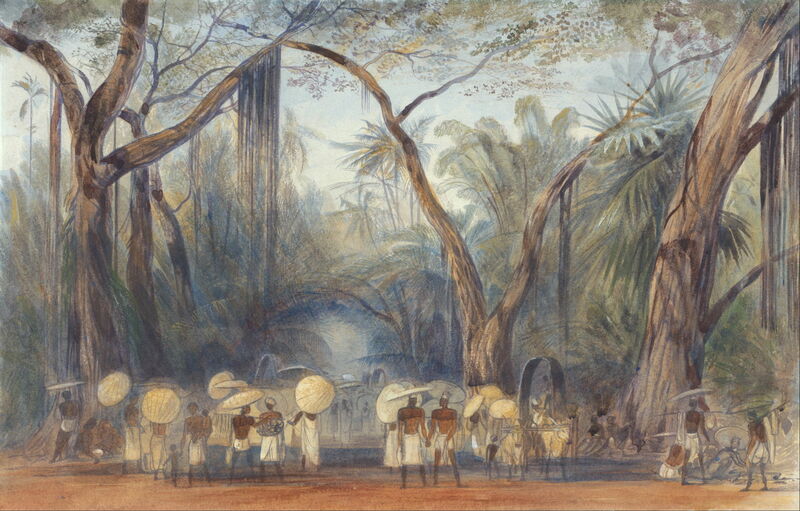 Although undated, I suspect that Lear’s watercolour of Coolies on the Road near Kalicut, Malabar was painted at around this time. Calicut or Kozhikode is a city in the state of Kerala, on the Malibar coast of south-west India, nearly two hundred miles to the west of Bangalore. The city is a major trade centre for locally-produced commodities like pepper, coconut, coffee, and rubber, and the labourers shown here were probably engaged in the production and transport of those products. In 1878, he visited Monte Generoso in Switzerland; sadly the view and light of the Villa Emily was spoilt when another house was built nearby, so in 1880 he bought another plot of land in San Remo, where he had the Villa Tennyson built. He moved there in 1881, and it remained his base until his death. My final selection from Lear’s extensive range of landscape paintings is among his most spectacular, showing the great mountain Kangchenjunga from Darjeeling (1879). Darjeeling is high in the Lesser Himalaya, at an elevation of just over two thousand metres (over 6,500 feet), in the far north of West Bengal, India. 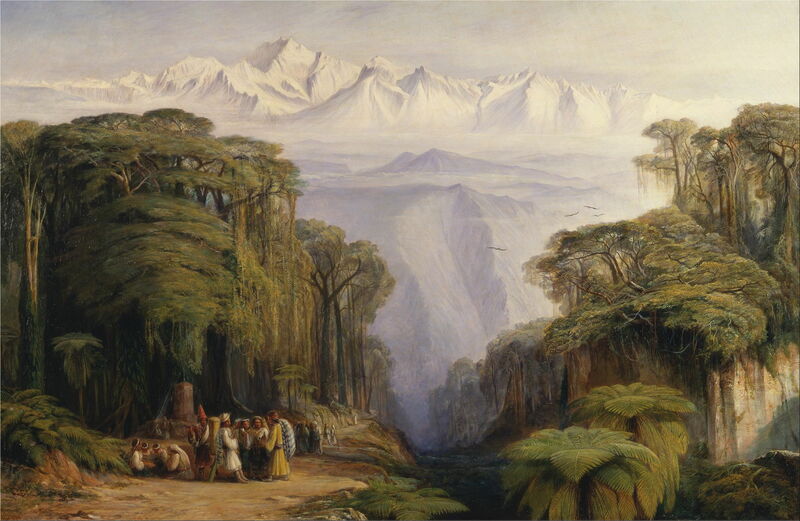 Famed for its tea plantations, it became a ‘hill station’ for British residents of India in the early nineteenth century, and just a couple of years after Lear painted this view, it was connected by the Darjeeling Himalayan Railway to New Jalpaiguri. Kangchenjunga is now, and was then, ranked the third highest mountain in the world, with an elevation of 8586 metres (28,169 feet). Its first successful ascent was not made until 1955; because it is a sacred mountain, teams who attain the summit stop short to avoid its violation. The Kangchenjunga massif is best viewed from Darjeeling, which is about eighty miles away. Kangchenjunga itself is the obviously highest peak, to the left of the centre of the ice-covered massif seen here. Although he became increasingly infirm in these later years, Lear could not stop travelling. Most years he returned to Switzerland, and undertook a walking tour of Perugia, Florence, Pisa, Spezia, and Genoa in 1883. He was devastated when his pet cat Foss died in 1887, and the following year, at the remarkable age of 75, Edward Lear died in San Remo. Lear is well known and greatly loved for his verse, but I think he was also an exceptional landscape artist whose paintings deserve to be better known. His wide range of creativity is remarkable, as was his determination to go where few had gone before. Posted in General, Life, Painting and tagged Brett, Church, landscape, Lear, painting, travel. Bookmark the permalink.